Belgian duo, Samir Bekaert and Maarten Vaderwalle arrive at Expanding Records, one of the more enduring electronica labels out there. 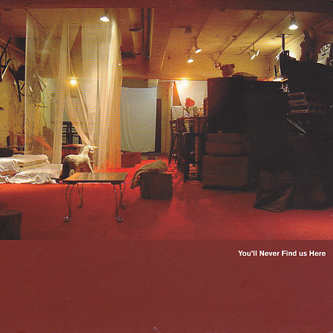 You'll Never Find Us Here really doesn't fit with that sort of classification however, instead offering a richly varied selection of instrumental productions and tuneful home-listening excursions. Putting acoustic guitars and pianos to good use, Pq make soundtrack-like vignettes, with highlights such as the string-bestowed offering 'Jocelyn' and Max Richter-ish outing 'Your Perception Of Red'. Elsewhere you'll encounter acoustic guitar flurries of James Blackshaw proportions ('Will You Still Be There? '), a solitary ballad ('Louise On Earth', featuring a faintly spooky child's vocal) and the expertly produced 'Somebody Should Repeat My Summer', which sounds a little reminiscent of Helios. The influence of abstract, beat-driven, post-IDM electronics remains present, with a sequence of three tracks at the end of the album bringing to mind the output of primetime Hobby Industries or Morr Music: 'In Praise' is like an Opiate production with an electric guitar added to the mix and there's more top quality laptop juggling around the corner, providing clicky electronics and glitch rhythms for entries 'Hold Me' and the inappropriately titled 'Hidden Track'.